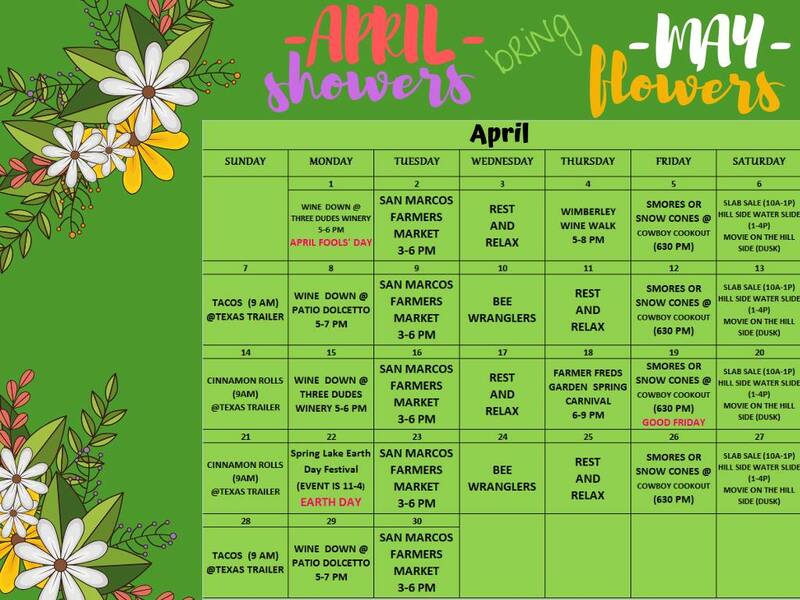 San Marcos is heating up as summer looms. 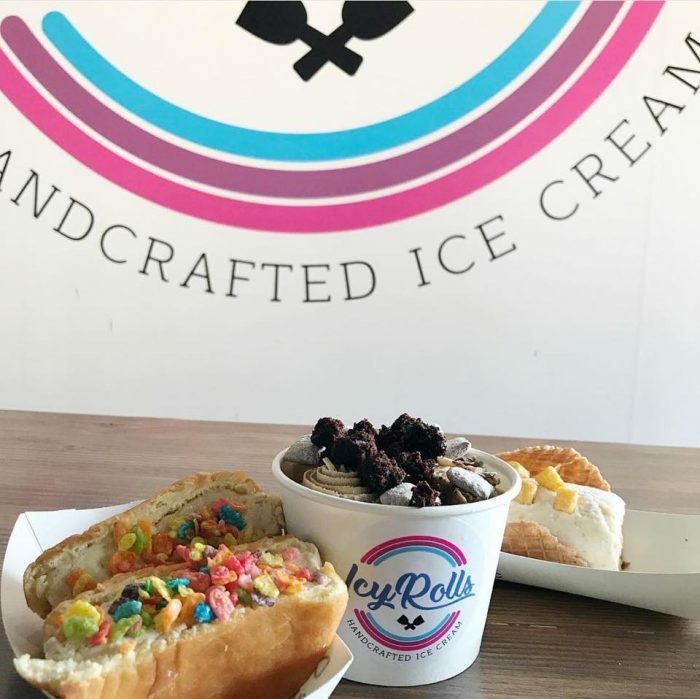 IcyRolls Handcrafted Ice Cream is the perfect place to replenish your energy after a hike or swim. 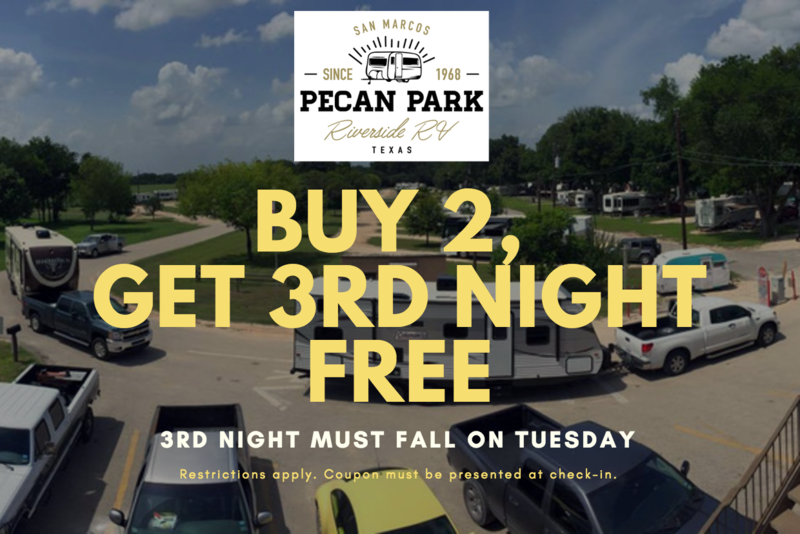 IcyRolls is located a mere 10 minutes from Pecan Park Riverside RV Park, in a small strip center across from the Texas State campus. 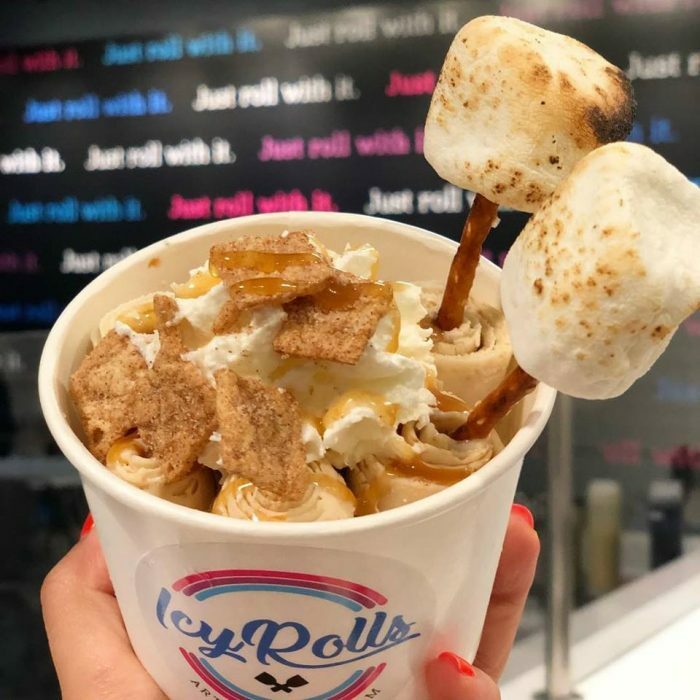 This adorable little ice cream shop takes advantage of the coolest trend in cool treats right now, tasty Thai-rolled ice cream. Have you seen anybody making these icy rolls? 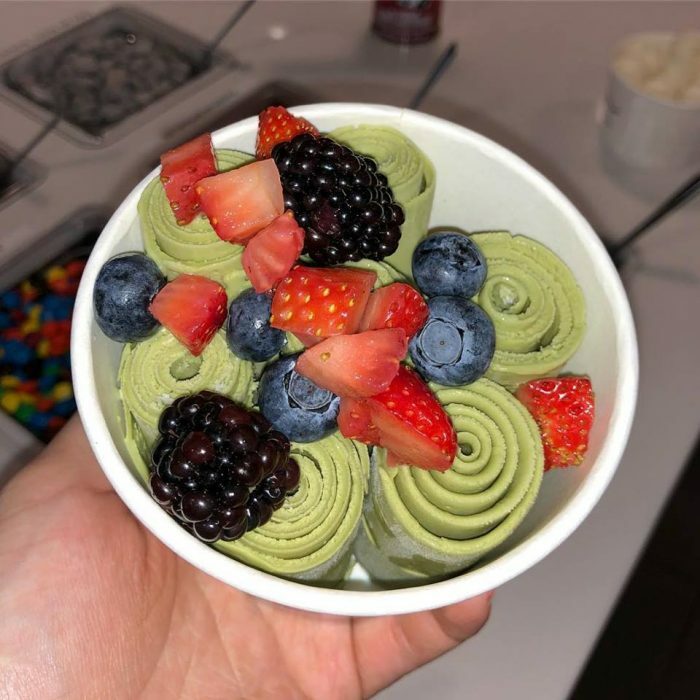 Popularized by the street vendors in Thailand, Thai-rolled ice cream shops are popping up globally and have made their way to San Marcos. It’s as fun to watch someone making these festive treats as it is to eat them. Well, almost. They are DELICIOUS! First, the ice cream makers pour a specially-made, liquid ice cream onto a frozen slab and spread it out across this “canvas” until it’s frozen. At that point, they add whatever flavors the customer wants, then mix and mash it all up, creating the desired flavor on the spot. They then spread it out and scrape it off the slab in rolls. Add toppings, and ta-da! Icy perfection. Watch the mesmerizing video here. IcyRolls offers 12 flavors daily. These flavors run from the classic Lone Star vanilla, Cookies & Cream, and Espresso, to the exotic Thai Tea and Avocado Alamo (with sweetened condensed milk). You can even order one of three cereals to make the Breakfast Cereal flavor. The rolled ice cream is served in a cup, waffle cone taco shell, or a bun. With the addition of graham cracker toppings, chocolate syrup, and a toasted marshmallow, you can have a S’Mores special, for example. Ask your IcyRolls server for her favorite combo or get creative! IcyRolls posts frequent specials on Instagram, as well as mouthwatering photos. 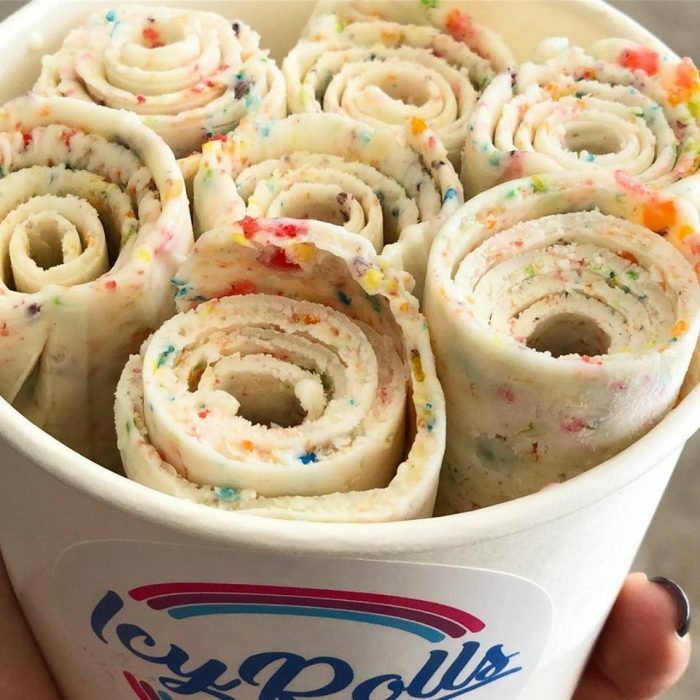 Next time you are craving a sweet treat, check out IcyRolls. After a hike or swim, you’ve surely earned it. Ready to get to San Marcos NOW, so you can try IcyRolls? You can book a reservation with us online.